Palestinian political prisoners are escalating their struggle following attacks by Israeli special forces on imprisoned Palestinians in Nafha and the ongoing denial of family visits and violations of prisoners’ rights. On Wednesday, 5 August, 120 prisoners, mostly affiliated with Fateh, began an open hunger strike in sections 1, 4 and 10 in Nafha prison, in protest of the ongoing attacks, in which Israeli special forces invading the prison cells injured 30 prisoners including Ahmad Sa’adat, the Palestinian political leader and General Secretary of the Popular Front for the Liberation of Palestine, who recently released this letter to the international movement for the boycott of Israel. On 6 August, prisoners affiliated with the Popular Front for the Liberation of Palestine announced that on Sunday, 9 August, they would launch an open hunger strike in all Israeli prisons, led by Sa’adat and demanding an end to the denial of family visits, medical care for sick prisoners, improved living conditions in prisons, the end of administrative detention, and a ban on the storming of prisoners’ cells by Israeli special forces, including the Metsada unit that attacked the prisoners in Nafha. Take action to support the prisoners’ demands and their strike! The branch of the Popular Front for the Liberation of Palestine in Israeli jails, led by the General Secretary Comrade Ahmad Sa’adat, has decided to launch an open hunger strike beginning Sunday, 9 August 2015, due to the continued onslaught of frenzied attacks against Palestinian prisoners by the Prison Administration, and its refusal to accept the just demands of the prisoners. * prohibiting invasions and raids by special units of the Zionist forces, including the Metsada unit, on the sections and cells of the prisoners. The prison branch of the Front also stresses that this step is being taken to defend the rights of our people in the framework of the prisoners’ national movement, and is a challenge by the prisoners to the policies and laws of the occupation, in particular the new law authorizing force-feeding of prisoners on hunger strike, and to the ongoing violations against the prisoners, and also to the recent statements by some Zionist leaders and officials about the issue of Palestinian prisoners. The PFLP’s prison branch urges the masses of the Palestinian people to engage in the broadest campaign of support and solidarity for the prisoners; this strike is one stage in our ongoing confrontation and struggle with the occupation. With this statement, hundreds of Palestinian political prisoners are making clear their intention to launch a mass hunger strike on 9 August; Palestinian prisoners from other factions are also expected to escalate their steps of protest as well, up to and including open hunger strikes. Palestinian prisoners from Hamas were suddenly transferred from Nafha to Gilboa prison in the north on Tuesday, sparking a call for disobedience in the prisons from prisoners affiliated with Hamas. The current hunger strike in Nafha and the strike that will begin on Sunday requires support and solidarity also from people and movements around the world. Samidoun Palestinian Prisoner Solidarity Network fully and unconditionally supports the prisoners in their demands and urges actions around the world by friends of Palestine and Palestinian communities to support these prisoners. 2. Send a solidarity statement. 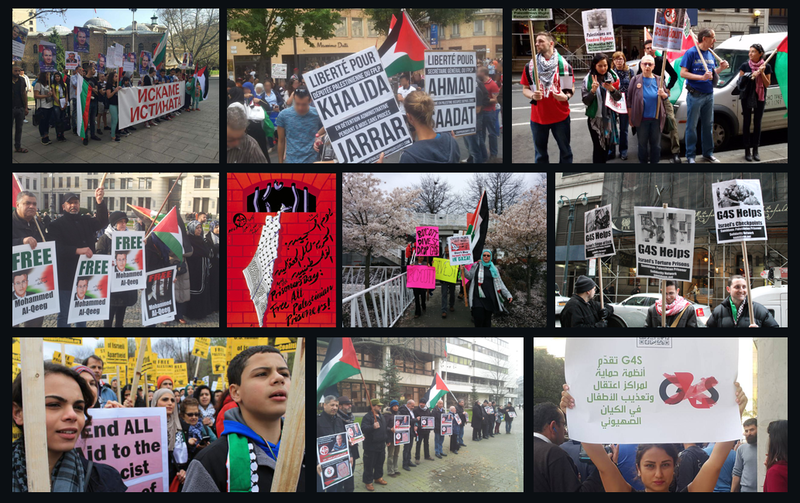 The support of people around the world helps to inform people about the struggle of Palestinian prisoners. It is a morale booster and helps to build political solidarity. Please send your solidarity statements to samidoun@samidoun.net. They will be published and sent directly to the prisoners. 3. Hold a solidarity one-day hunger strike in your area. Gather in a tent or central area, bring materials about Palestinian prisoners and hold a one-day solidarity strike to raise awareness and provide support for the struggle of the prisoners and the Palestinian cause. Please email us at samidoun@samidoun.net to inform us of your action – we will publicize and share news with the prisoners. 4. Protest at the Israeli consulate or embassy in your area. Bring posters and flyers about administrative detention and Palestinian hunger strikers and hold a protest, or join a protest with this important information. Hold a community event or discussion, or include this issue in your next event about Palestine and social justice. Please email us at samidoun@samidoun.net to inform us of your action – we will publicize and share news with the prisoners. 5. Boycott, Divest and Sanction. Hold Israel accountable for its violations of international law. Don’t buy Israeli goods, and campaign to end investments in corporations that profit from the occupation. G4S, a global security corporation, is heavily involved in providing services to Israeli prisons that jail Palestinian political prisoners – there is a global call to boycott it. Palestinian political prisoners have issued a specific call urging action on G4S. Learn more about BDS at bdsmovement.net.